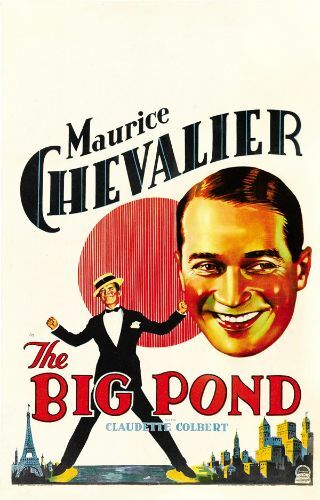 Le Grande Mare is the French-language version of Paramount's The Big Pond (1930), with Maurice Chevalier and Claudette Colbert in their original roles as Pierre Mirande and Barbara Billings. Pierre is a Venetian tour guide, who falls in love with wealthy American tourist Barbara. Her male relatives think that Pierre is merely a fortune-hunter, but Barbara's mom persuades her husband to give Pierre a job in his chewing-gum factory. The menfolk finally approve of Barbara's choice when Pierre comes up with the brilliant, money-making idea of coating the gum with liquor! Both La Grande Mare and The Big Pond were filmed simultaneously at Paramount's Long Island studios, but if the stars were tired out by this procedure, one would never know it from their enthusiastic performances.